nshapiro was awarded the Basic Barnstar by warren for their work in this research note. Domestic chemical ecologies have both many toxicant sources and many toxicant sinks. Formaldehyde slowly and silently off gasses from engineered woods, carpets, and permanent press clothing. Some of these silent emissions waft out open windows. Others are absorbed by human bodies or the bodies of companion species. 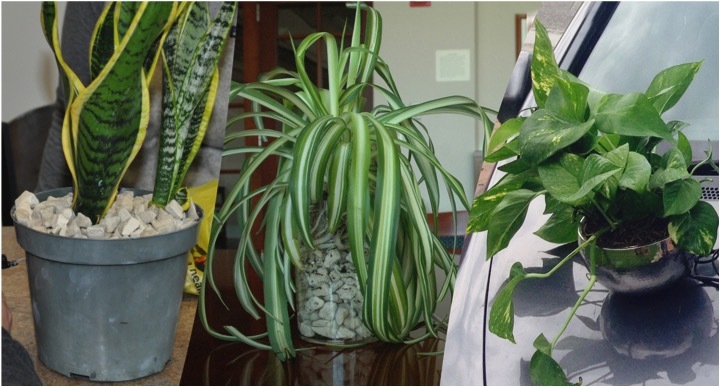 Others still are metabolized by decorative indoor plants and the microbes that inhabit their roots. Since the 1990s we have been hearing promises of plant-based air filters. See, for example, this patent filed in 1993. Some critics (see this 2009 critical review) find fault in the claim that plants-on-their-own can clean indoor air and state that the average home would need 680 plants to adequately scrub the air of toxicants. Research indicates that it is not so much that different plants remediate the air differently, but that different plants cultivate different rhizospheric conditions by their root exudates and root autolysis. Plants with quantitatively more bacteria dwelling in their rhizosphere won't remediate as much atmospheric formaldehyde as plants with fewer overall microorganisms amongst their roots but more gram-negative rods. The formaldehyde removal capacity of plants and their bacterial companion species increases as exposures increase, and over time the bacteria appear to "acquire an increased taste" for exposed toxicants and up-regulate their metabolism. Phyto-bio remediation does not appear to be reaction-limited but diffusion-limited. The amount of air breezing through the roots and across the leaves of indoor plants is minimal. 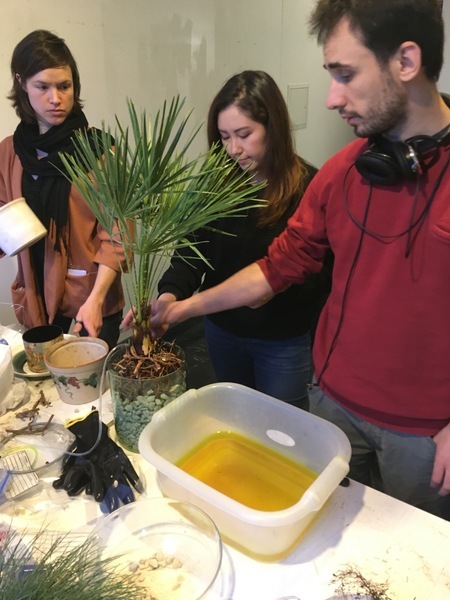 The Public Lab DIY Indoor Air Remediation Kit builds upon these observations that, at least in theory, increasing the airflow through the root system could increase the remediation capacity of plants by upwards of 200 fold. Plant air scrubbers would not require the intermittent replacement replacement of filters but would become more efficient overtime. Plants manage decomposition underground by providing sugars to symbiotic and beneficial fungi and bacteria in order to manage root growth and decomposition. Plants spend more energy below ground than above ground, and seasonally grow and kill roots just like leaves. We're piggy backing on this process, using plant-managed colonies of beneficial bacteria to scrub formaldehyde, a naturally occurring product of decomposition. While there is evidence on both sides to indicate either the efficacy or inefficacy of plants-on-their-own as indoor air filters, there have been no published studies on the efficacy of plant systems with increased airflow, like the prototype offered by Public Lab. A similar $230 system made by a for profit company claims that it can clean a 10'x14' room in an hour. Some interior-landscaping industries suggests that 1 regular plant on its own (which could be 200 times less efficient than the Public Lab prototype) per 100 sq feet. critics say its more like 45 regular plants per 100 feet (surprise! you live in a greenhouse now!) so that would be 680 plants in a 1500 sq foot house. But if our system lives up to the theory you could have just three planters to maintain clean air across your home or one in your bedroom or one in the office. In the first field test of our remediation tool we found a 40% reduction of formaldehyde in a two bedroom trailer with a single planter. In the second field test we found and an 84% decrease in a conventional two bedroom home. See our first field test results here, yielding a 40% reduction of formaldehyde after a month. Our second field test, which more closely follows our design protocol, can be found here, and resulted in an 84% reduction in formaldehyde and a reduction in signs and symptoms of exposure after 12 weeks. You'll need to buy an aquarium pump (the $5.59 model 10 here). You can find this model at the above link or in most chain pet supply stores although it will be a few dollars more expensive in a brick and mortar store. A few feet of flexible airline tubing ($1.99), available widely. A non-draining pot (easy to find at a second hand store for a couple dollars). A plant (see the above list). A hydroculture growth medium such as Growstone and a 25 oz jar of activated carbon ($11-$20) from the fish aisle at the pet store). The growth medium will ship in units often much larger than what you will need for this project. Ask your local nursery or flowershop if you can buy as much as you need for your pot (should be less than $10). For a 1500 sq. ft. home three plants might be best but one plant in one room that you spend a lot of time in or are particularly concerned about is a good way to start. When you get the growth medium there is a little bit of work you have to do to get the plant ready. You can imagine how jarring it must be for a plant to suddenly have air rapidly flowing through its roots. So these first few steps ensure that your plant will be healthy so that your air can be healthy. It would be great if you could take pictures of the steps and we can help you along the way. Once you get the plant happy, all you need to do is periodically water it, and its metabolic capacity will actually increase with time (unlike mechanical filters that decrease with time). The aquaculture set up also decreases the amount of watering you have to do. Soak the activated carbon and the ceramic media in water to saturate. (Can be combined in a large bucket.) Soak a minimum of one hour. Both the carbon and the media absorb and hold moisture. The activated carbon will make noise when initially submerged in water. This is completely normal. After soaking the media, rinse with water until water runs clear. (The inner pot is often used as a strainer for this process.) Use a doubled cheesecloth or an old T-shirt to strain the carbon. Once the water runs clear, if you have not already done so, combined both the ceramic and the carbon in clean water and mix thoroughly. Mixing the media is easier to do when submerged in water. Remove the plant from its pot and gently remove as much soil from the roots as possible. Soak the plant's roots in room temperature water for a short time. This will help loosen the remaining soil and make it easier to remove. After soaking, gently agitate the roots in the water to help remove soil. Gently massaging the root ball in the water will remove a significant amount of the soil. Using a fresh pail of room temperature water, a shower-head or faucet, clean the roots of all remaining soil, being very careful not to damage the root system. Repeat this process until the roots are entirely free of soil. This is very important for the future integrity of the plant! Once your root system is entirely free of soil, cut back roughly a quarter of the root system with a pair of sharp scissors. This will stimulate growth of new "water roots." Note: keep root system moist while transplanting; do not allow roots to dry out. Now that your plants roots are entirely free of soil and your media is free of dust, you are ready to begin potting. Pot the plant as you normally would just within the growth medium you have prepared. Be sure to snake the aquarium tubing over the lip of the container, with the end terminating high in the root ball. You will want to never have the water level in your planter high enough to be sucked into the tubing and destroy or contaminate the pump. Allow your plant to acclimate itself to its new environment for at least two weeks before turning on the pump. How do I know if my indoor air purifier setup is working? Make sure air is flowing through the airline and there are no kinks. If you place your finger over the end of the airline do you feel the air pressure and hear the sound of the pump change? If so you're in good shape. One way to check the air purifier's efficacy is to keep a health symptom log. You can start the log when you start building the kit as you won't be turning on the pump for two weeks. Do your signs and symptoms of exposure change? See this note for more in-depth answers and this wiki for the latest information about our formaldehyde test kit. Instructions are adapted from the plans of former NASA scientist, Dr. Bill Wolverton. I think this is great. I'd mentioned to @liz but the question How can i know if my plant-based air filter is working? is great, and I think it'd be excellent to note it (and the multiple answers to that question in this activity -- even briefly. As to some kind of simple "hello world" test to confirm you've done this activity successfully, what do you think -- listen or feel for airflow with your finger or ear, somewhere? That way, "successful reproduction" of this activity doesn't have to encompass a topic as big as "how do I measure improved air quality" -- which could be left to a followup test. Just thinking about how to acknowledge the ways of knowing, and make them distinct from the questions we're hoping to answer! Great work here, Nick! warren awards a barnstar to nshapiro for their awesome contribution! Hi, this is an interesting project. I'm curious, do you think it's really necessary to convert the aquarium pump from blower to suction? If you blew the air into the roots, it would still have to exhaust somewhere. I don't have the testing equipment you do but would be curious to see results comparing suction vs blower. Hi, Nick, can you post the total estimated cost? Thanks!! Excellent project! I've been diving into Wolverton's studies (alongside all other phyto-remediation studies) to get an idea of what options I have for a newly renovated, unventilated apartment building. Opening windows hasn't been helping since I live next to a gas station - the fumes just waft in so I try to be judicious about how often the windows are open. (4.) Pot the plant as you normally would just within the growth medium you have prepared. Be sure to snake the aquarium tubing over the lip of the container, with the end terminating high in the root ball. You will want to never have the water level in your planter high enough to be sucked into the tubing and destroy or contaminate the pump. Do you have measurements or a picture of what this looks like? What is "high enough" normally? Where upon/around the root ball does tubing normally lie? 2) Are there more finished images of the complete system? I see the Early Model (2014) and a few pictures of other builds, but more is merrier - especially around the vaccuum setup. Thanks all! Looks like I'm late to some important comments. Thanks, @warren. I've updated the note per both of your requests. @Odie91that's a great question and one that many people ask. I'm concerned that if we don't reverse the diaphragm we might risk suspending dust from the growth medium in the air (the pump has a small filter in it so sucked air would reduce that risk). But there are many reasons why you might want to let it stay as a pump: 1) it is safer to water (no risk of sucking water into the pump and ruining it if its pumping air out) and 2) you can pull more HCHO into the system if you have a pump on the ground while the plant is in the window as HCHO is heavier than air. I'm not sure I understand your third question! the air gets pulled down past the leaves and the roots and then through the airline and out of the pump itself. The pump is external to the planter which makes it more adaptable to whatever type of pot strikes your fancy and makes the whole setup much cheaper as there is not custom manufacturing. @nshapiro - Thanks for getting back to us! To clarify: a vertical (outflow facing upwards) or horizontal (outflow facing toward the root ball) are both ideal setups? Any thought about the hose coming from the bottom of the planter, pointing upwards right next to the root ball or under a light layer of larger medium? Any experimentation on integration of a squrrel cage fan (ala the Plant Air Purifier) versus the aqua-vaccuum-and-hose setup? We haven't compared to the squirrel cage fan because they are expensive (iif you've found some inexpensive versions please let me know) and add engineering complexity, reducing the accessibility and increasing the price in two ways. If you wanted to do a comparison, I might be able to supply an HCHO meter to test their efficacy. In our early prototypes the airflow was 0.3 litters per minute. Its not clear to me if speeding up that flow rate would correspond to an increase of air purifying capacity. The fans move more volume but with lower force, which may or may not lead to an increased actual flowrate through the growth medium. Looking forward to hearing more about your build as it unfolds! @nshapiro I went the lazy route and grabbed a few of the Plant Air Purifiers I'd be down to measure my levels - will likely revisit building my own in some months. I'll send you an email. Is there any chance to know the exact proportion of the diameter/size of the planter/jar and the amount of activated charcoal to make it work? How long would you estimate it would take someone to do this who hasn't done it before (Assuming we've gathered all the materials)? Hi @nickyname sorry for the delay! you can use many different size pots for this from about 6 inches to 18ish inches. In out kits we use 9.6 ounces of activated carbon, but that amount is not due to an exact science and is for a 9ish inch pot. Hi @stevie, that's a great question! I was just thinking about this myself. I think I would allow an hour for this although it would almost definitely take less than that (maybe 30 minutes?). The thing that takes the most time is washing the plant roots, and that a maximum of 10 minutes. Christophe is going to be posting our newest version in a research note soon, so the steps will change slightly very soon. We built one in China, and I'lll upload info soon - soaking the rocks and charcoal took an hour but other than that, it took us maybe 30 mins more, tops. But we did skip the step of cleaning the roots because we found a plant that was sold in just water. Hi @nickyname sorry for the delay! you can use many different size pots for this from about 6 inches to 18ish inches. In out kits we use 9.6 ounces of activated carbon, but that amount is not due to an exact science and is for a 9ish inch pot. Hi @stevie, that's a great question! I was just thinking about this myself. I think I would allow an hour for this although it would almost definitely take less than that (maybe 30 minutes?). The thing that takes the most time is washing the plant roots, and that a maximum of 10 minutes. Christophe is going to be posting our newest version in a research note soon, so the steps will change slightly very soon.